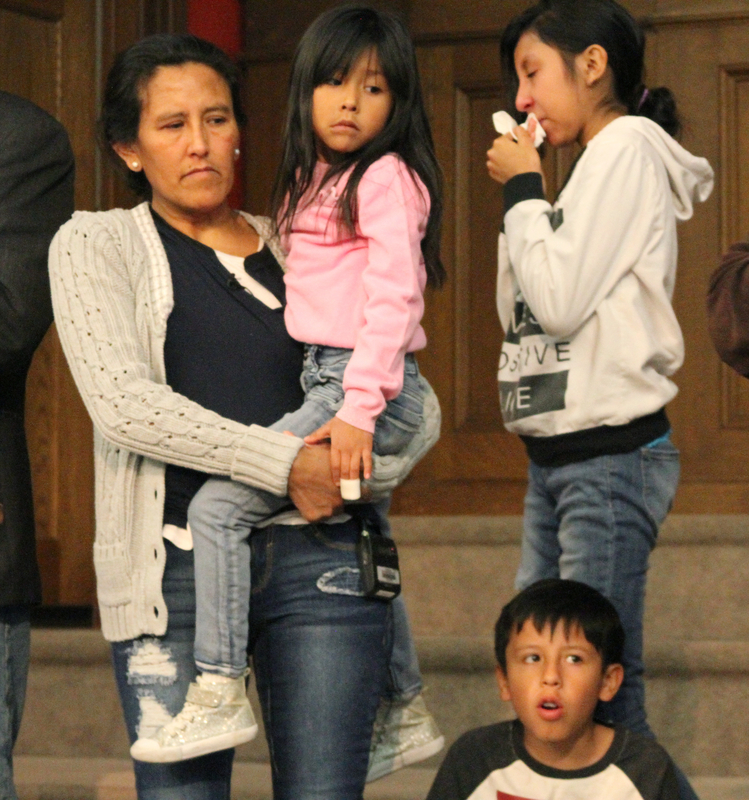 DENVER — The fight of one undocumented mother living in Colorado escalated Wednesday after she fled to a Denver church to avoid immigration officials who are now seeking to deport her. "It will not end today," Jeanette Vizguerra proudly said to the applause of her supporters. She spoke in her native tongue of Spanish to explain why she is fighting to remain in the U.S., despite efforts to deport her. 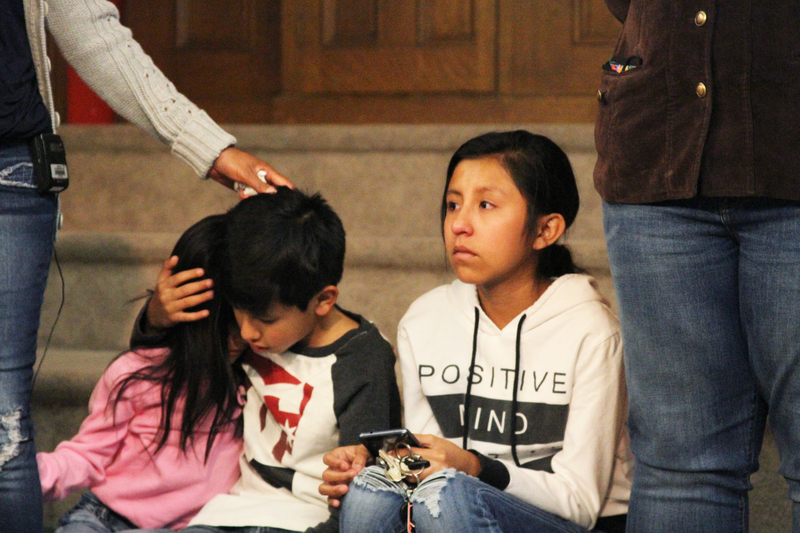 On Wednesday, a stay of deportation for Vizguerra was denied as she continued her quest in Centennial to keep her family whole. Vizguerra's lawyer advised her not to appear in person to the hearing, which was the sixth such hearing on her behalf. The request for a renewal of her stay was made 70 days ago. Instead, Vizguerra fled to the First Unitarian Church in Denver, which agreed to give her sanctuary. Hans Meyer, Vizguerra's lawyer, spoke at the courthouse, saying Immigration and Customs Enforcement (ICE) agents were prepared to arrest and deport her from the U.S. should she have showed to her hearing. "I absolutely believe ICE would have arrested her this morning. It appears they had absolutely no intention of engaging in good faith," Meyer said of documents that were signed when he appeared in the courthouse. In an appearance inside her new temporary home, Vizguerra spoke about her fight and decision to avoid ICE, calling it "a good decision." According to Meyer, Vizguerra is a survivor of violence who escaped from Mexico City to the U.S. in 1997 with her husband and eldest daughter, who was then 6 years old. Meyer said Vizguerra's young family is rooted in Colorado and has legally lived here while paying taxes and abiding by U.S. restrictions. She has been convicted of two misdemeanors during her time in the U.S. In February 2009, Vizguerra was convicted of criminal possession of a forged instrument for having a Social Security card with her name on it, but without a valid Social Security number. She served a 23-day sentence after her conviction. And in May 2013, she was convicted of illegal entry after going back to Mexico for her mother's funeral and returning to the United States. Her attorney said she was sentenced to a year of supervised probation for that case. Vizguerra has seen judges award her five successful stays of deportation before the sixth was denied on Wednesday, and Meyer directly attributed that to President Donald Trump. "We're living in Trump's administration," Meyer said, noting the facts of her case haven't changed, saying only the administration has. "If anything, the facts of her case are only more compelling and more sympathetic ... she has complied with every request of ICE over the last four years." Vizguerra has an active application for a U Visa, which are granted to nonimmigrant violent crime victims and their family members if they work with law enforcement in the investigation and prosecution of the crime against them. Meyer said she has been timely with her submissions, but her case is tangled in a government backlog. A paralegal with Meyer's office, Julie Gonzales, said the U Visa had been pending for at least a year. Denver Mayor Michael Hancock's office said Wednesday afternoon the city and county had both supported Vizguerra's application for the U Visa by signing an I-918 supplemental form in August 2015. "This isn't on her for the delay, this is because of the government's backlogs," Meyer said. "We shouldn't be deporting people and taking them away from their children while we're at the same time looking at whether or not they should be legally (allowed to stay)." Vizguerra confidently spoke on Wednesday with her family surrounding her, saying she is challenging the federal government to live up to "American ideals." She has four children -- three of whom are U.S. citizens, and an adult child who is legal to work under the Deferred Action for Childhood Arrivals (DACA) program. 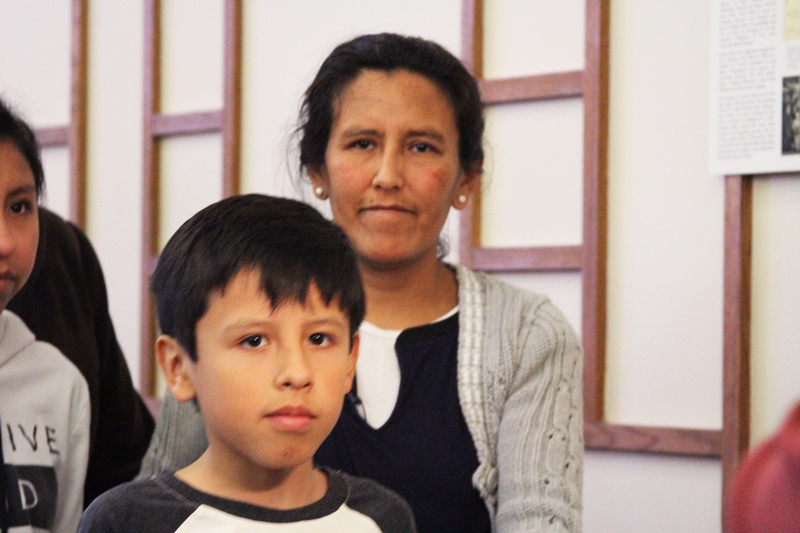 Her three juvenile children -- Luna, 12, Roberto, 10, and Zury, 6 -- all joined her at the church Wednesday. "We're not here to challenge the government in a negative way, but to challenge the government to live up to its ideals," she said. Meyer spoke to Vizguerra's qualifications for staying, noting she has survived diversity, raised a family and acted as a U.S. citizen. Then Vizguerra defended herself, taking a jab at President Trump. "I've been working here for the last 20 years, paying taxes with the number the government gave me, and that's a big difference from President Trump," Vizguerra said. Vizguerra plans to stay in the church most of the time, saying she doesn't believe immigration will wait for her around the clock. The church will serve as her base of operations. "I'm not leaving here until I have a legal document that allows me to walk freely down the street," Vizguerra said. "We're taking this to D.C.," Meyer said to a round of applause. Members of the We Belong Together campaign delivered a letter to ICE officials at its Washington headquarters at 2:30 p.m. Mountain Time demanding officials extend Vizguerra's deportation stay or close her case. 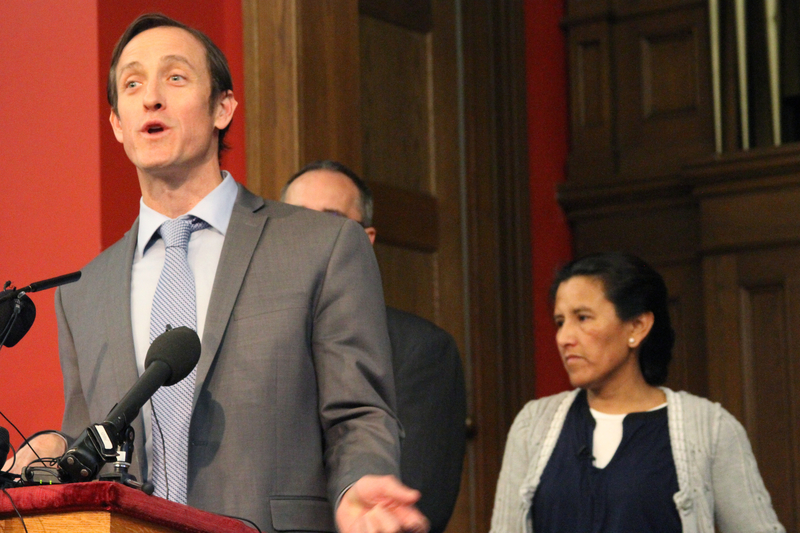 Rep. Jared Polis, D-Colo., has also introduced a bill in the House of Representatives, HR 752 , that would allow her to stay in the U.S.
“What’s happening to Jeanette Vizguerra is appalling and the result of a broken immigration system – a system made worse by the chaotic actions of the White House and ICE. Jeanette is not a threat to our community. She is a mother of four, an active community member, and someone who has persistently pursued legal status through the proper channels. She has now become the latest victim of wrongful enforcement actions, executive orders and policies coming out of Washington that are punishing immigrants, tearing apart families and scaring our communities. Sen. Cory Gardner, R-Colo., released the following statement on Vizguerra's situaiton. Jeanette Vizguerra's fight has already spurred a strong social outpouring of support, with supporters taking up the hashtag #JeanetteBelongsHere. Supporters wrote to KMGH saying, "We love you Jeanette stay strong." There were those who reacted negatively, too. One detractor wrote to Denver saying, "She should take her kids with her and get out. I bet all of her children were born and fed at taxpayer expense." Below, see some of the photos of support for Vizguerra. Click here if the photos don't appear on the Denver7 app .